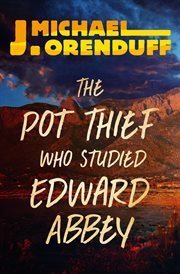 The item The pot thief who studied Edward Abbey, J. Michael Orenduff represents a specific, individual, material embodiment of a distinct intellectual or artistic creation found in Evansville Vanderburgh Public Library. Before making a somewhat notorious name for himself as a salvager of antiquated pottery and other desert artifacts, Hubie Schuze was an eager student at the University of New Mexico-right up until they booted him out. Now, he's back at UNM as a pottery teacher. It should be a breeze, but campus life has changed dramatically in the past twenty-five years. From cell phones to trigger warnings to sensitivity workshops, Hubie has to get up to speed fast or risk losing control of his class. But his dismay at the state of modern academia takes a back seat when a young beauty working as a life model is murdered-and Hubie becomes a suspect. Taking the investigation into his own hands, he soon uncovers a wide palette of sketchy suspects that includes both the self-involved student body and the quarrelsome art school faculty. But what he doesn't know is that the murderer has a new artistic project in the works: a headstone for the grave of Hubie Schuze . .